How can clients make decisions about intangibles like life insurance when it's so difficult to decide on common, physical products like computers? "Ultimate" sounds like the best. 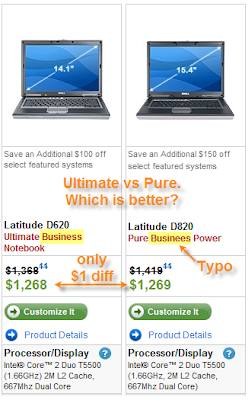 Microsoft calls their $499 ($299 upgrade) version of Windows Vista "Ultimate". But "pure" sounds natural. In contrast, financial products like life insurance are compared among companies. How do we decide on one product over another? How do we help our clients understand the advantages? So they aren't caught 'twixt will and will not in their decision to buy. You're in a social gathering. Other attendees may become potential clients. Or not. it's "Hello, how do you do?" For years, I'd say "I'm an actuary", which would elicit a blank stare and possibly questions about why car insurance costs so much. Not really a conversation starter. A typical introduction is too short and puts the onus on the other person to figure out what you do. That can lead to misunderstandings and stereotypes. For example, actuary = probabilities = boring = scram. Let's try it. I'll go first. You know how we're surrounded by risks we can't do much about (e.g., global warming, air quality, war)? Well, I help tame financial risks -- which we can tackle. I blend actuarial science with business sense to give peace of mind. Have you taken steps to measure and manage your financial worries? Does that draw you in? The Metro Toronto Convention Centre is jampacked for the Real Estate and Wealth Expo (Mar 24-25). I splurged on VIP admission but there are hundreds of people in the line at the registration desk. I wonder what general admission is like. Later I learn that 45,000 to 50,000 are attending. At $100 a ticket, that's $4.5 million. The logistics are handled well. There are guides everywhere --- well-versed and genuinely helpful. Most of them are probably supplied by the venue. Signs abound. Printed programs are plentiful. In the keynote hall which probably seats at least 10,000, there are lots of screens. So everyone can see and hear. The theme of getting rich quick resonates with the audience. There are many strategies: stock trading (signup for training! ), foreclosures (signup for training! ), etc (signup for training!). Training for a typical 2-3 day seminar costs $1,000 to $2,000 after the "once in a lifetime" show discounts. There are numerous guarantees (though getting your money back isn't usually one of them). Instead, you can keep attending the seminars. Spouses can usually attend for free. Get lots of reviews --- mostly negative --- here. As the hours pass, the audiences become desensitized to the sales pitches. So more powerful salesmen (and yes they are *all* men) step in. To maintain the audience's interest (and to attract them in the first place) there are presenters like Tony Robbins and Donald Trump. There are short 30 minute breaks with the likes of former boxer George Foreman (the only nonwhite) and author David Bach (The Automatic Millionaire, etc). It was interesting how each presenter tried to show they were the best. Tony Robbins talks about states, which are temporary. I talk about traits, which are permanent. Unlike other presenters, I'm not here to sell you books and tapes. One commercial real estate deal is better than 50 residential deals. Billionaires bashing billionaires: I'm better than Richard Branson because The Apprentice goat higher ratings than his show. I'm better than Donald Trump because my dad didn't give me $25 million when I turned 21. Various forms of testimonials were used. I'm glad that we don't use such aggressive techniques. I wouldn't want to be like you.